During my hiatus from this blog, my boyfriend and I moved from a small apartment, to a much bigger apartment. 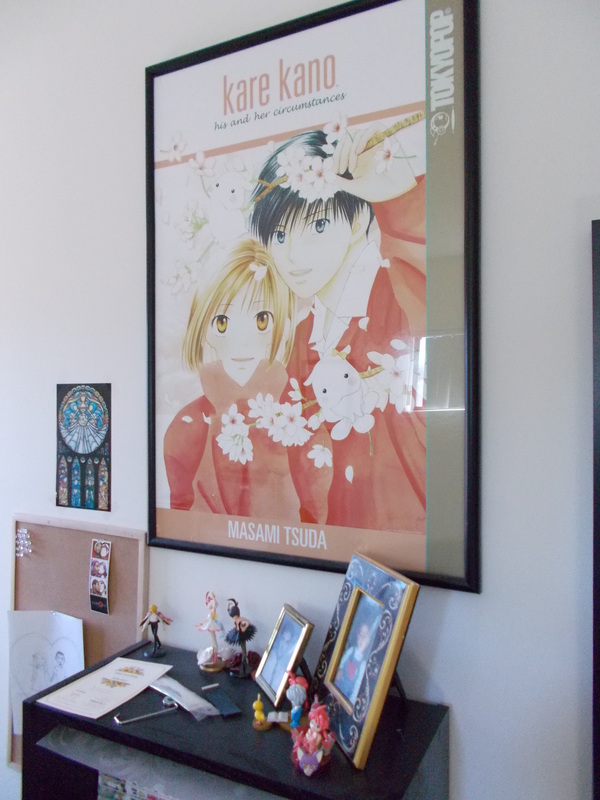 Having the space has been great for spacing out my manga collection, but another great perk of our new place is that the owners don’t care if we hang stuff up! 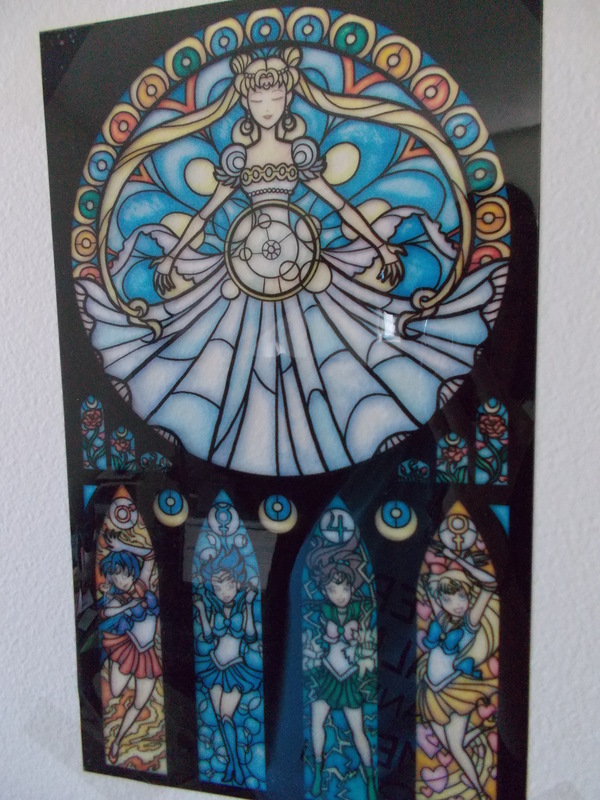 First up, a Sailor Moon poster. If you’re collecting the series, you’ll recognize this one as the cover art for volume six. I bought this trio of dachshunds from a friend at this year’s Wondercon in Anaheim. 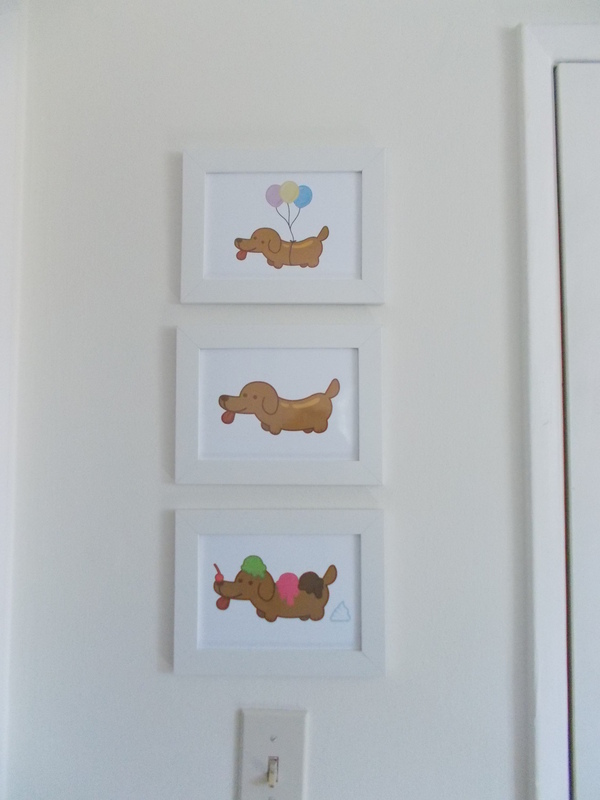 I’m a huge dog lover, so there was no question about hanging these cuties up. I got this slightly-faded beauty from the TOKYOPOP garage sale. In hindsight, I probably should have grabbed some of the other posters like this, but I didn’t have the space in my apartment at the time. Now it gets a lovely spot right next to my desk. You can also see some of my Princess Tutu figures, which aren’t really anything to write home about. 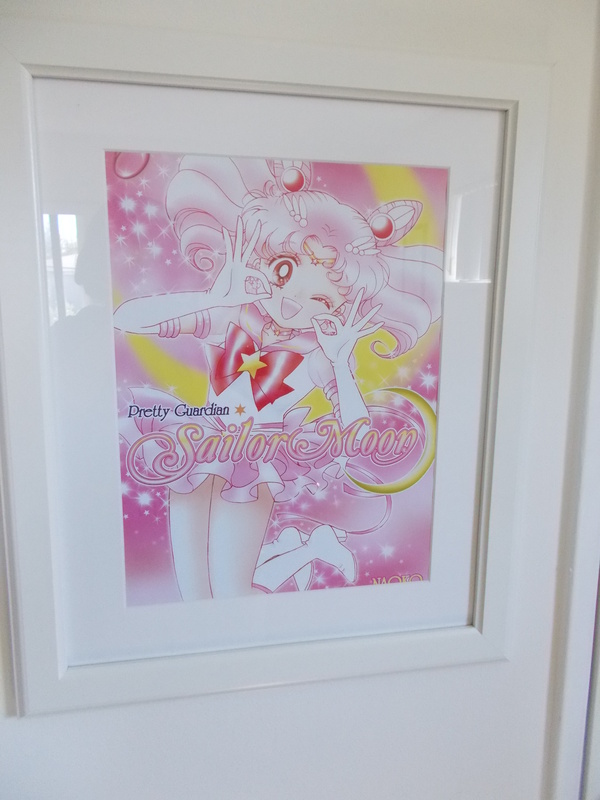 This is Sailor fanart that was gifted to me by a friend. As you can see, it’s in the style of stained glass church windows, but you might not be able to tell it’s printed on a transparency! That’s why it’s not in a frame like the others. 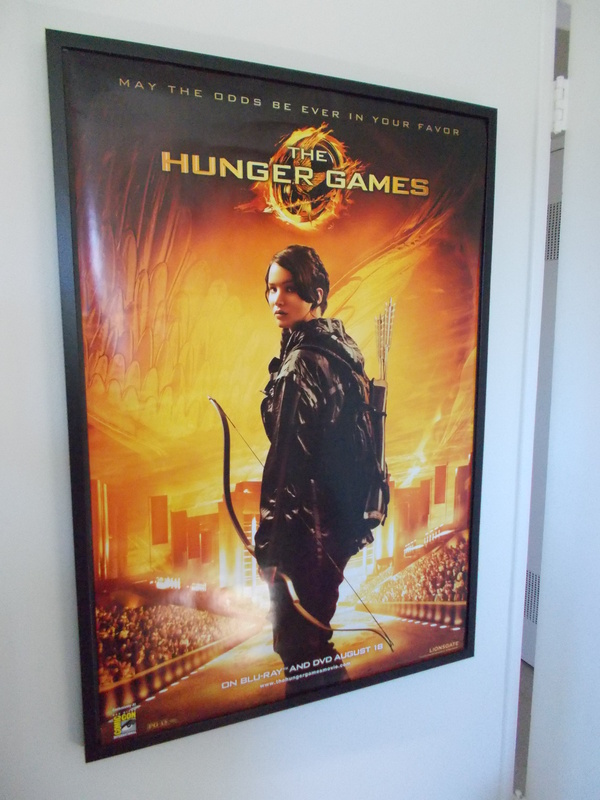 I fell in love with The Hunger Games novels right before the movie came out, so I *had* to get this poster at San Diego Comic Con this year. More fan art! This time of How to Train Your Dragon. I bought this as a gift for my boyfriend at FanimeCon a number of years back. It actually wasn’t for sale, but I begged the artist to sell it to me. Needless to say, the boyfriend loved it. Now it sits over his desk. The boyfriend and I are also huge fans of Avatar: the Last Airbender. 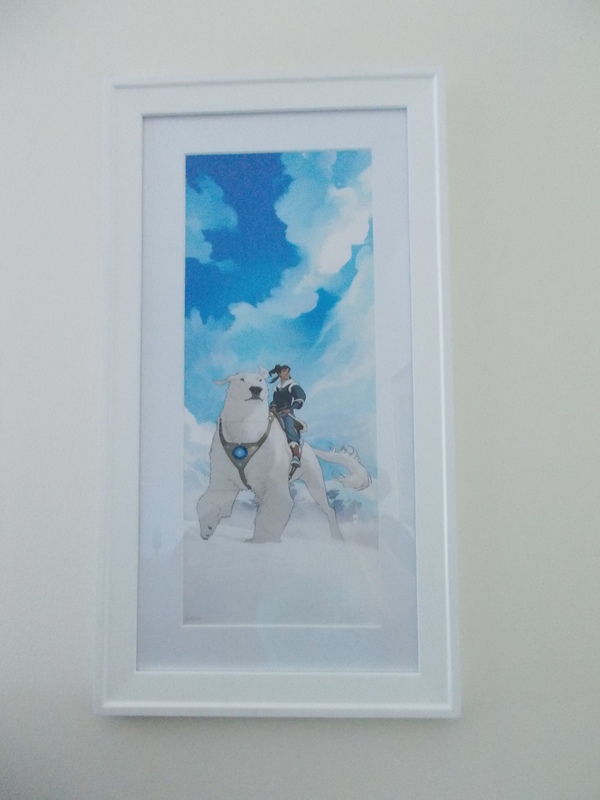 So when I saw this beautiful limited edition Legend of Korra print being sold at San Diego Comic Con a few years ago, I had to have it! I wound up buying the last two prints and gave the other one to my best friend. 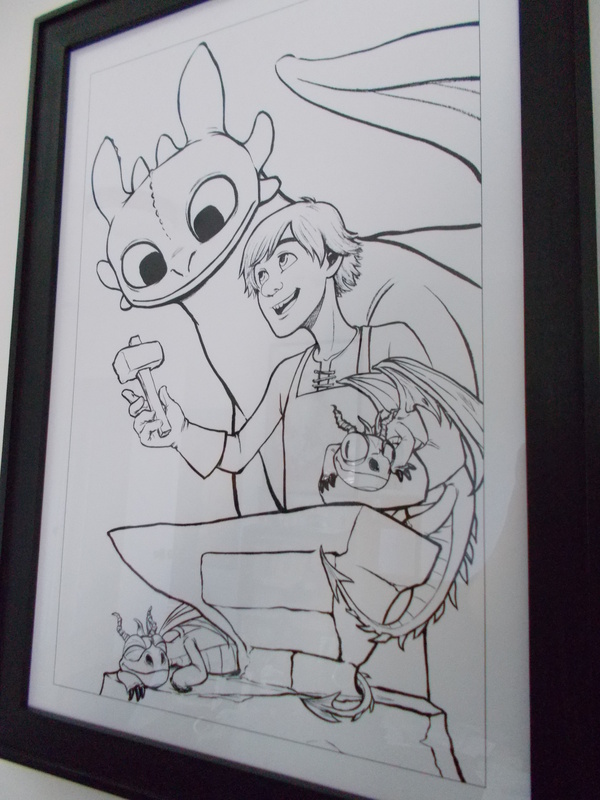 It came already matted, so it looks just gorgeous in its frame. NSFW Warning! There are some boobies here. This isn’t geeky art per say, but I get geeky about weird things and Gustav Klimt’s dazzling artwork is one of them. I got to see his masterpiece “The Kiss” in Vienna a few years ago, along with some of his other work, and it just blew me away. When an exhibit of his sketches came to Los Angeles, I jumped on the chance to see more of his work and got myself a print of my favorite print in the exhibit. This particular piece was partially inspired by Japanese woodblock prints, so I guess Klimt and I have some similar tastes. 🙂 I’m not a huge figure collector, but I just couldn’t pass up the cute Tezuka figures in the front when I saw them at Meltdown Comics. The Junko Mizuno skull was a freebie at SDCC awhile back and the Domo-kun skeleton was a gift. 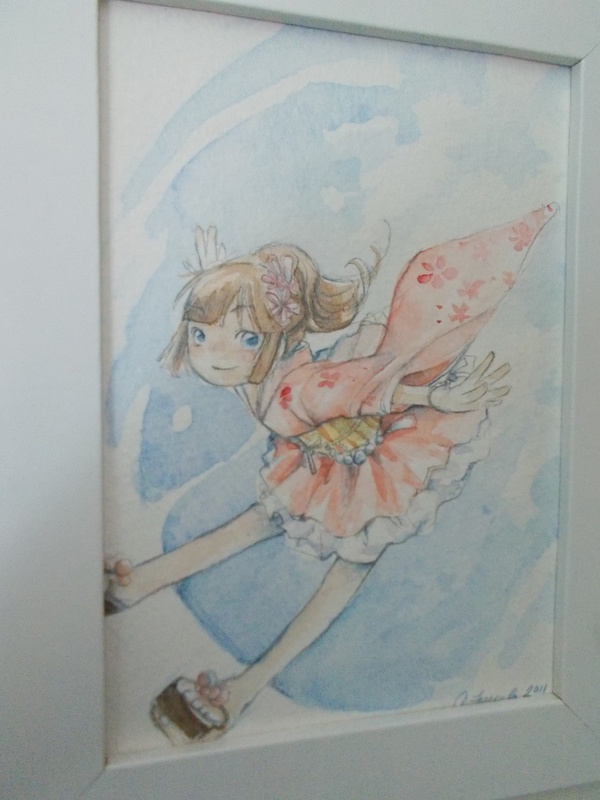 This is an original watercolor by Audra Furuichi, the creator of Nemu*Nemu, whom I’ve known for a little while thanks to her frequent appearances on the California convention circuit. This print speaks for itself. 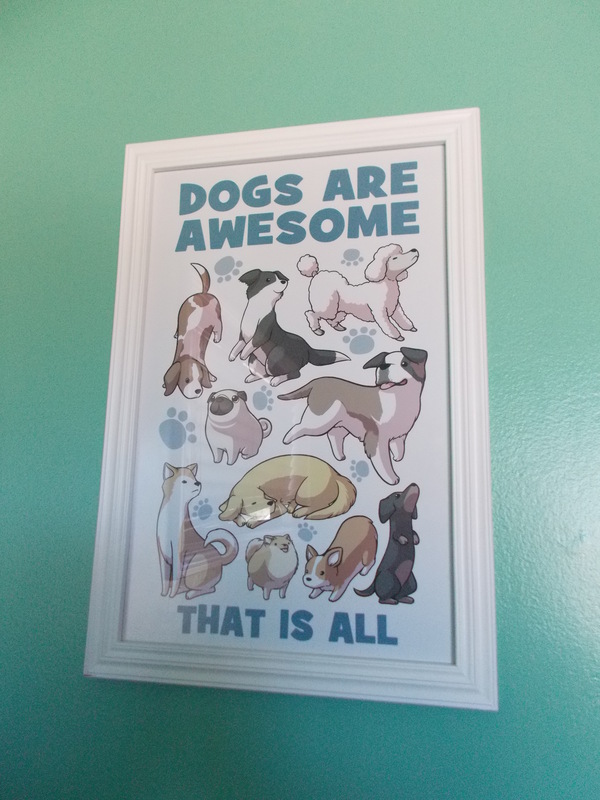 I got it at San Diego Comic Con this year and finally decided to hang it in our brightly-colored kitchen where everyone can see my affinity for dogs. The artist draws a webcomic called Kiwi Blitz. 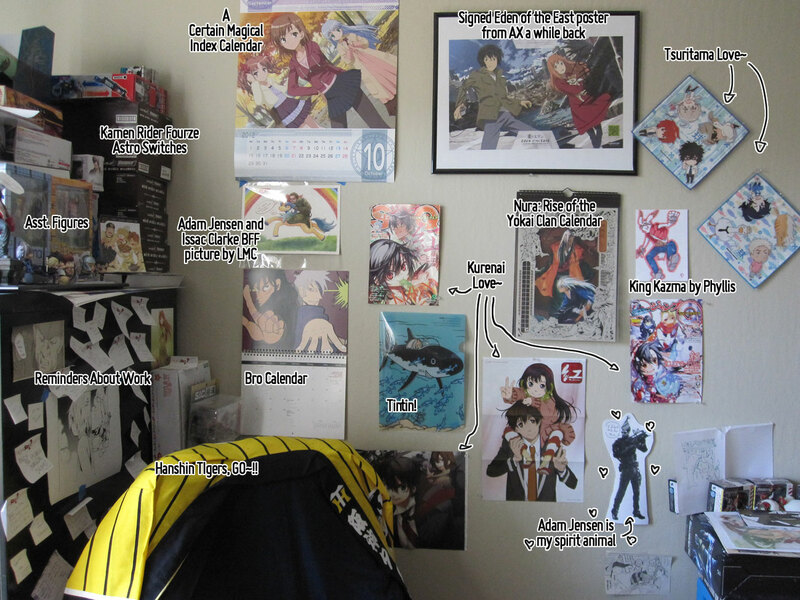 This entry was posted in comics, Discussion, manga, webcomics and tagged Avatar: the Last Airbender, Domo-kun, fan art, FanimeCon, Geeky art, How to Train Your Dragon, Hunger Games, Junko Mizuno, Kare Kano, Legend of Korra, manga, Sailor Moon, san diego comic con, Tezuka, tokyopop, WonderCon. Bookmark the permalink. Oh, I LOVE reading these sorts of posts!! And I love, love, loooove that How to Train Your Dragon picture~! Your desk set-up is very cool. Lots of calendars! I never got close enough to see what everything was when we were there for our (WAY TOO SHORT) visit. Heh, and ooooh, shall make sure to share that artist with my friends, she’s got some rather lovely art.